The enduring cypress points optimistically upward. The bald cypress grows well in wetlands, floodplains, and along rivers, making it the state tree for Louisiana. There are more than 130 species of cypress trees all over the world; some are deciduous and some are evergreen. Different types of cypress trees have taken on cultural and religious significance. Cypress trees have been used to represent the universe, heaven, the cycle of life, freedom and truth. This design is also available in the following sizes: 3"x6" / 4"x4" / 4"x8"
Emu Handmade Tiles can be installed in kitchens, bathrooms, showers and more. They also make excellent wall hangings (no frame required). Tiles are made by hand from stoneware clay using traditional methods. 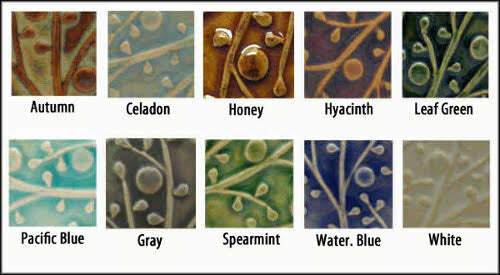 Available in several glaze colors, all non-toxic and all lead-free.